Black Bean Beef Burgers with Blue Cheese and Onion Marmalade are everything I aspire to be: a little fancy, but not fussy; classic, yet contemporary; memorable and totally tasty. OK, maybe I don’t aspire to be tasty, but Black Bean Beef Burgers with Blue Cheese and Onion Marmalade are an irresistible flavor mash up between two buns, and that’s just not personal comparison territory I’m prepare to enter. Juicy beef, hearty black beans, and spicy Dijon mustard form the patty. Tangy blue cheese and a sweet-sour onion marmalade cozy up on top. Grill, smother, then bite into one messy, marvelous hamburger. 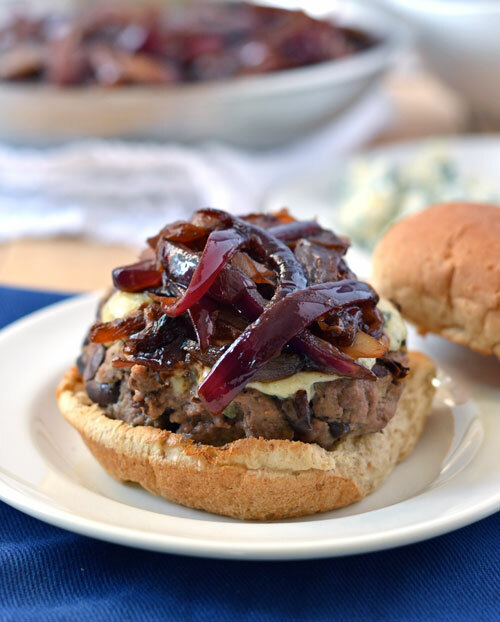 Black Bean Beef Burgers with Blue Cheese and Onion Marmalade are the latest dish in my Quick and Easy recipe series with California Olive Ranch. Last week, I kicked off this month-long collection of weeknight-worthy meals with Eggplant Ricotta Grilled Cheese. Like that stellar grilled sammie, Black Bean Beef Burgers with Blue Cheese and Onion Marmalade boast gourmet taste with easy preparation. To create a smokey grilled flavor indoors (necessary hazard of apartment living and long winters), I use this reversible cast iron grill plate on my stovetop. It’s marvelous for all manners of grilled dishes and is oven-proof too. Black Bean Beef Burgers with Blue Cheese and Onion Marmalade are a flavor party on a bun, and tonight is burger night. Let’s boogie! A blend of lean ground beef, black beans, and Dijon mustard creates a juicy, flavorful hamburger patty. 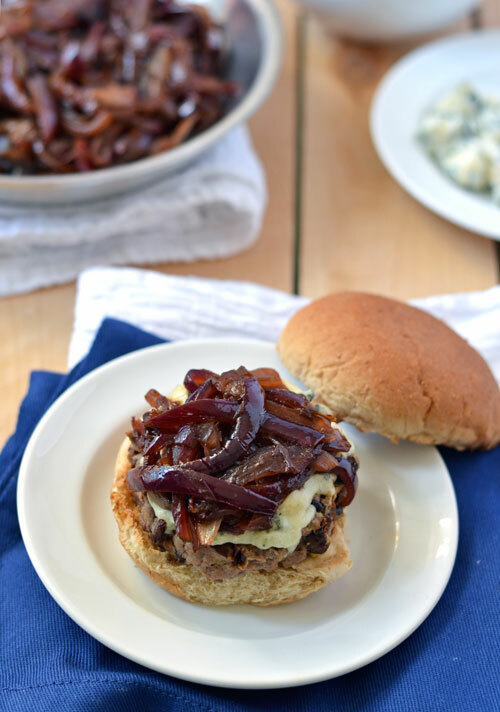 Top with tangy blue cheese and sweet onion marmalade for a black and blue burger that tastes gourmet and is easy and fast to prepare. Time-saving tip: Double (or triple!) the onion marmalade recipe and use it to top sandwiches, pizzas, or as quesadilla filling throughout the week! Prepare the onion marmalade: Heat 1 tablespoon olive oil in a large skillet over medium high. Add onions, brown sugar, and salt. Sauté for 15 minutes, stirring occasionally, until dark golden brown and tender. Add balsamic vinegar and cook 2 additional minutes. Set aside. Meanwhile, heat a large oven proof skillet over medium high. Place rack in the upper third of your oven and set oven broiler to high. Prepare the burger patties: In a large bowl, mash black beans. Add beaten egg, 3 tablespoons extra virgin olive oil, 1 tablespoon Dijon mustard, garlic powder, salt, pepper, and Worchester. Mix until incorporated. Add beef and stir in gently with a fork, being careful not to compress the meat. Divide the mixture into 6 portions and shape into approximately 3 1/2 inch-wide patties. Brush each side of the patties with remaining mustard. Brush the skillet with extra virgin olive oil to prevent sticking. Place burgers on skillet and cook for 3-4 minutes, until the mustard forms a golden crust. Flip, top with blue cheese, then cook approximately 3 additional minutes, longer if you prefer the burgers more well done. During the last moments of cooking, place the skillet under the oven broiler for 30 seconds to finish melting the blue cheese. 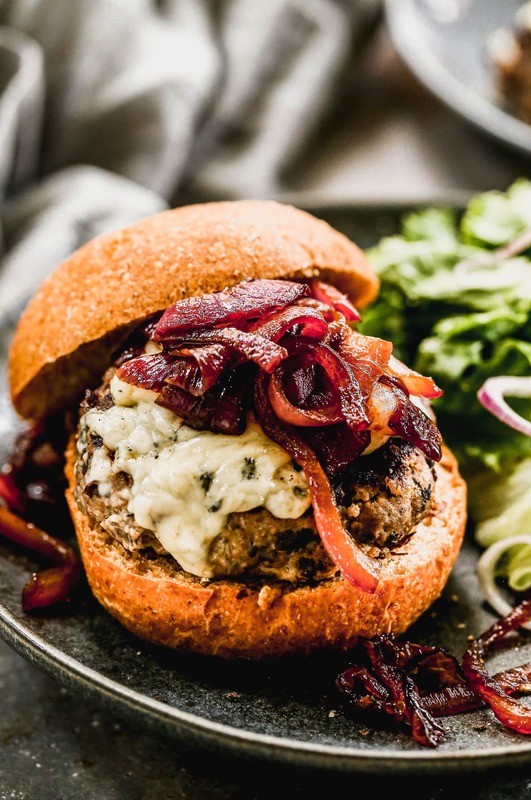 Top blue cheese burgers with a heaping spoonful of onion marmalade and serve immediately on toasted buns. This recipe was created by me on behalf of California Olive Ranch. California Olive Ranch compensated me for my time to develop and photograph this recipe and provided product for my personal use. All opinions are, as always, my own. The onion marmalade sounds fabulous! I don’t think I’ve ever had onion marmalade – but I bet the tangy vinegar and sweet onion did wonders for these black bean beef burgers! Shashi, if you love caramelized onions, you would be ALL OVER onion marmalade. Very similar flavor, but quicker to make, and these days, we need quick dinners! These look and sound fantastic!!! Loving all of the bold flavors! Yes, a bean burger with beef! My family might just eat this (I know I will!!!) I’m all over the spices and flavors in this burger. Onion marmalade; wow, only you can make that look good in the morning! Amazing recipe! Love these flavors!!! Blue cheese is my favorite! I’m an absolute sucker for it too. Thanks Tieghan! This is my dream burger! Blue cheese is the winner! Blue cheese = makes life better. Thanks Angie! Now who’s the burger maniac?! I – Love – It! High five my burger fiend friend! Did Ben just die over this recipe? It’s like everything guys love in one bite. I am drooling, Erin! This is a great combination of flavors – the onions, blue cheese and black beans. Amazing! Gahhh! I want this in my belly NOW. The onion marmalade just sets this burger over the top! Thanks a million Carrie! And seriously–> onion marmalade. I’ve started tripling the batch and putting it on just about everything in my life! I’ve never had a black bean burger but this recipe is making me SUPER excited to try it! The mix of the black beans and beef is awesome Steph! They are lighter (and more budget friendly) that way, but you still get the flavor and juiciness of the beef. Even carnivorous Ben didn’t mind. Hope you love ’em too! You are too sweet! Thanks so much and I’m glad you like the combination! Loving all the killer flavors in this burger combo!! Flavor party in my mouth is more like it! WOWZA! WOWZA just got added to my life vocab. Love it! Oh maaaaan! The dijon and sweet onions and sharp blue cheese all together is making my mouth water! I’m also in love with that cast iron skillet, but I don’t think we can use it on our electric stove top. :( You have no idea how much I miss our crappy apartment gas stove. Courtney, I never would have thought of that! We have electric, but it’s the super old/nasty coils. Why do I feel like you have the pretty, smooth ones? Oh life, so many trade offs. Awesome burgers! You are making me so hungry!! Thanks a million Julie. 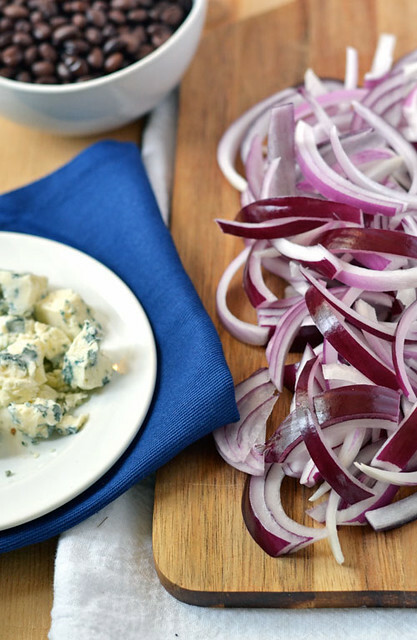 Blue cheese + caramelized onions has yet to ruin one of our meals! Don’t lie, you aspire to be tasty! ;P I love this flavor combo! It sounds absolutely perfect! I love onions on just about everything. The onion marmalade is definitely going to find it’s way onto just about everything. DO IT Kristi. I’ve tried the “put the onion marmalade on everything” approach, and I can say, it pays off :) Thanks so much for your comment! Have a great day. Wow, these look so delicious. Perfect combination of flavors! And the onion marmalade… I would put it on everything! Anne, I can say from personal experience that the onion marmalade DOES taste good on absolutely everything: Pizzas, sandwiches, quesadillas–go nuts! This is my kind of burger! Love the flavors! Wow onion marmalade sounds amazing! And with a black bean blue cheese burger, I’d be happy going meatless for an evening. This looks delicious! Lol Georgia! Sounds like our men would get along. I think that you are AWESOME! I have been married to my doctor hubby for almost 44 years and remember well being a student wife. I love you recipes and truly enjoy your commentary with each one!